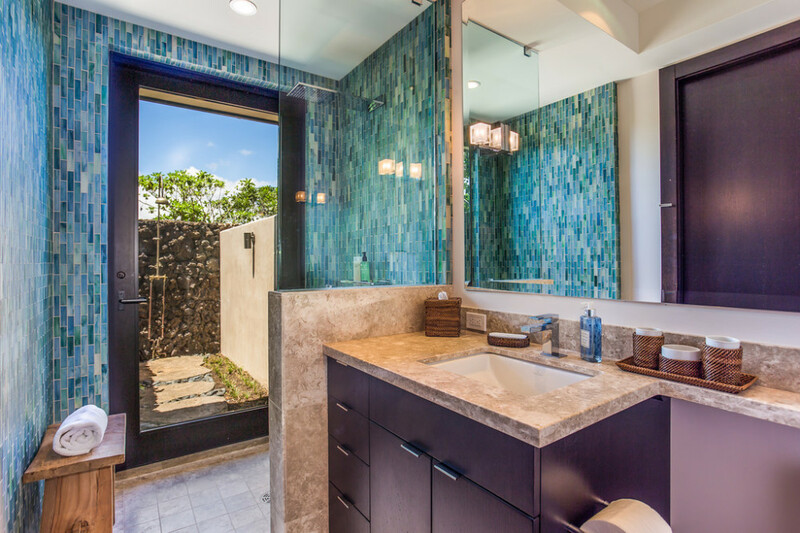 Artevilla at Mauna Lani – Luxury Vacation Homes, Inc.
Artevilla at Mauna Lani is a brand new, luxury, two story, five bedroom, ocean view residence situated just above the beach at Mauna Lani Resort. 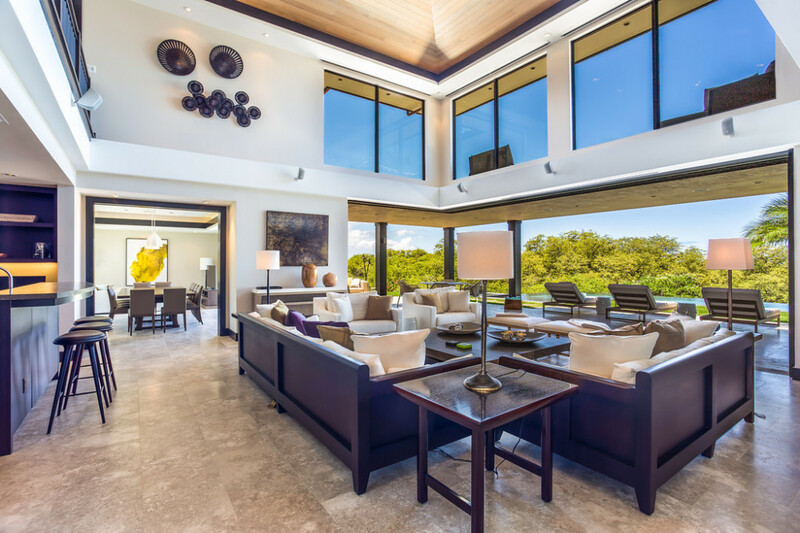 Built in 2013, this spectacular and unique property offers a spacious great room with a vaulted, twenty foot ceiling surrounded by large sliding glass pocket doors. 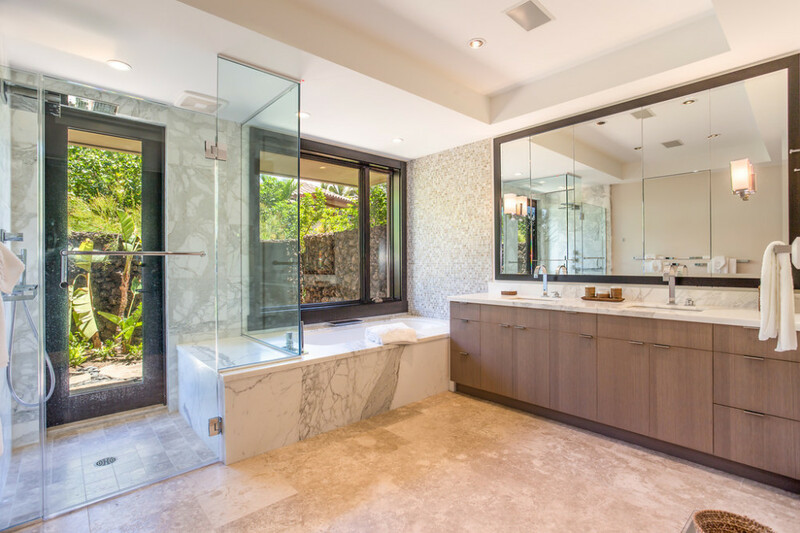 Accessible through a private courtyard, guests are welcomed to a spacious entry featuring a designer billiard table. 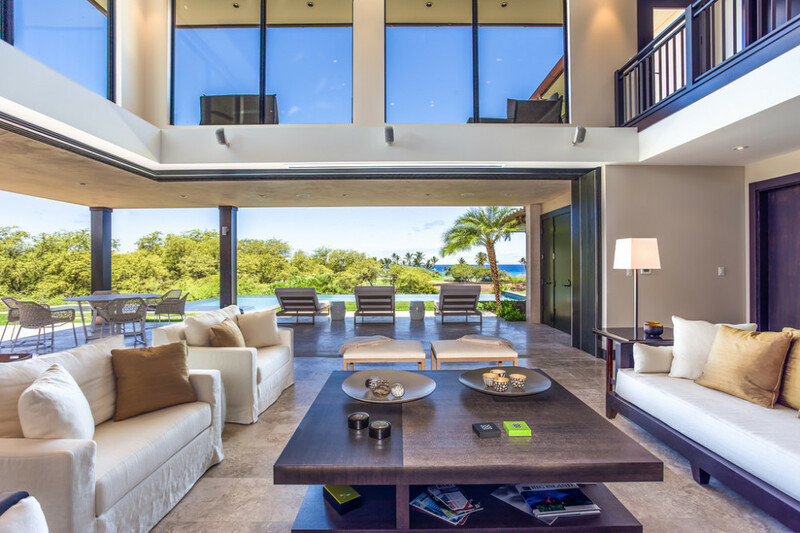 Two stylish and comfortable sofas and armchairs are the perfect place to enjoy the home theater system with Blu-RAY, Zappiti players and SONOS digital music system. 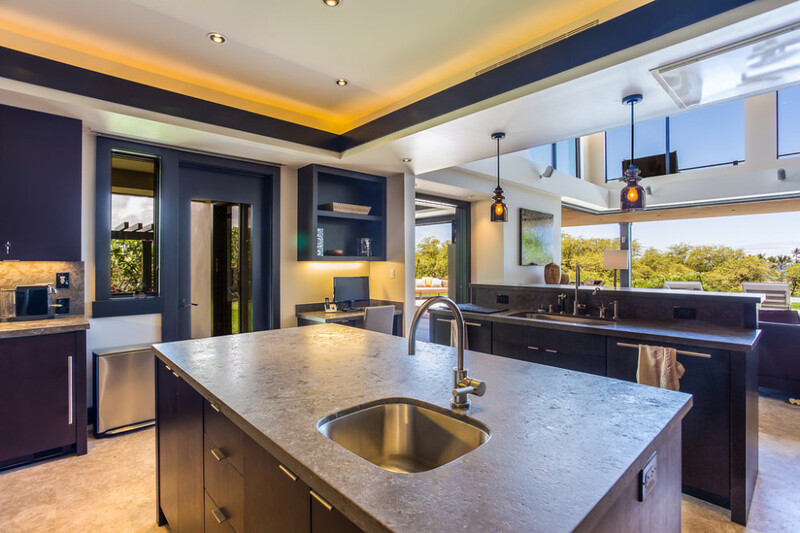 Adjacent is a gourmet kitchen which offers a 5 burner Wolf range, ovens and microwave, 2 large Sub Zero refrigerators, 2 dishwashers, stone counter tops and attractive wood cabinetry throughout. 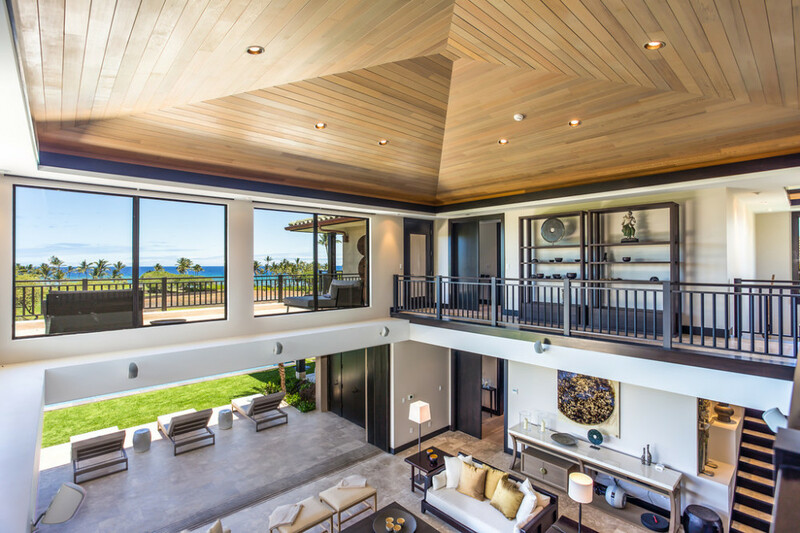 A separate dining room, with a seating for 12 guests opens to let the outside in. 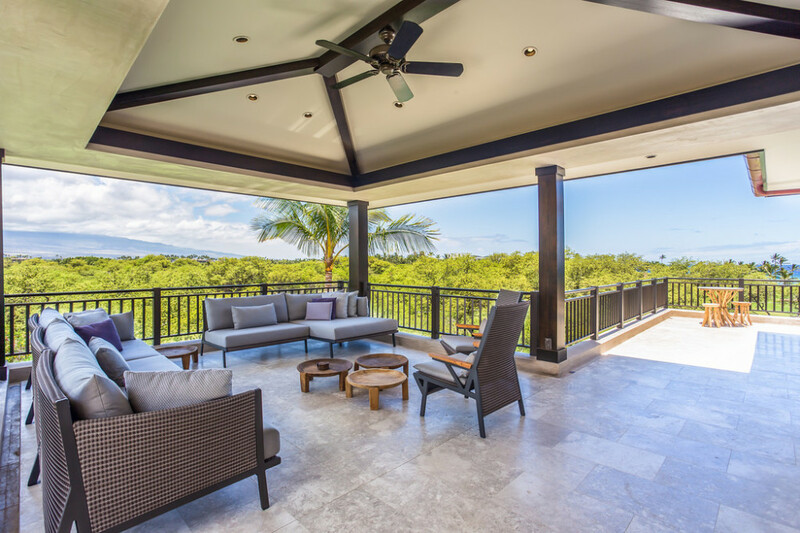 On the 2nd story, a mezzanine-corridor open to the great room below, leads to two guest bedrooms, a den, and a large lanai with both covered and uncovered space where you will enjoy spectacular sunsets and sweeping ocean to mountain views. 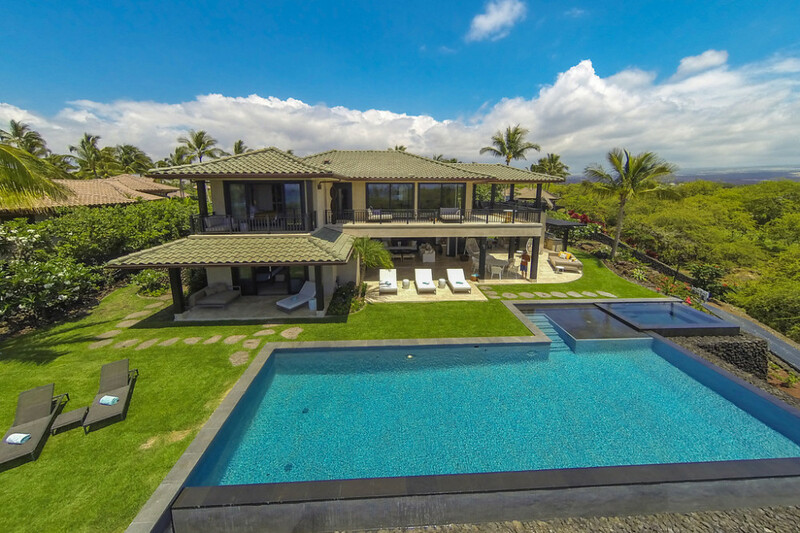 The house has 5 Bedrooms. 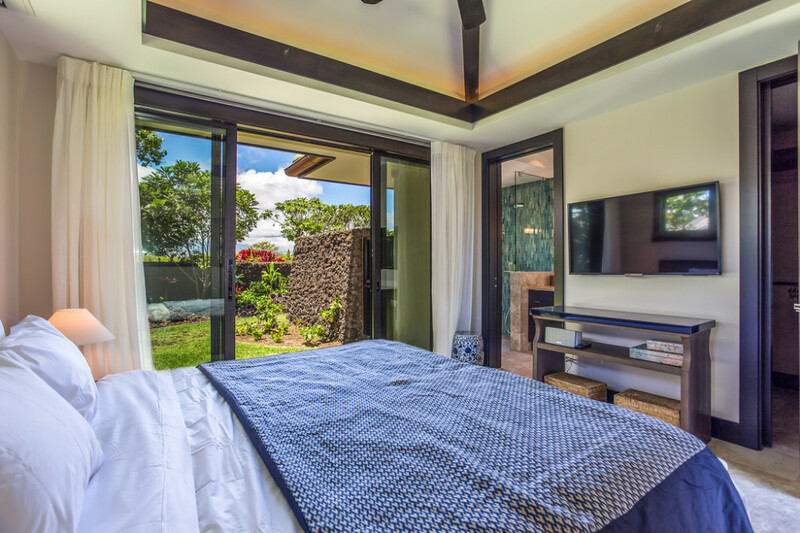 On the first floor, the master bedroom suite facing the ocean features a canopy king size bed, a writing desk, a walk in closet, luxurious bathroom with separate shower and tub, and a private garden with outdoor shower enclosed with beautiful natural lava rock walls. 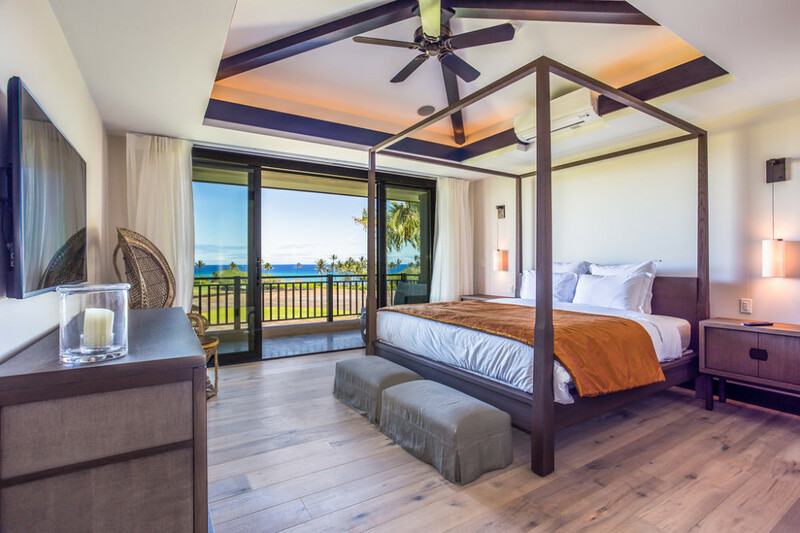 On the upper floor, the second master bedroom suite has a private balcony where you can enjoy unobstructed ocean views. 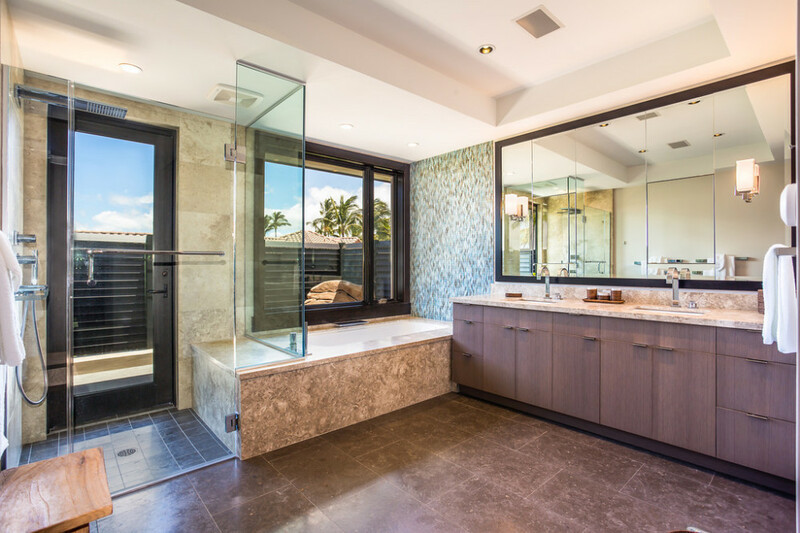 There is a walk-in closet and a large bathroom with separate tub and shower. 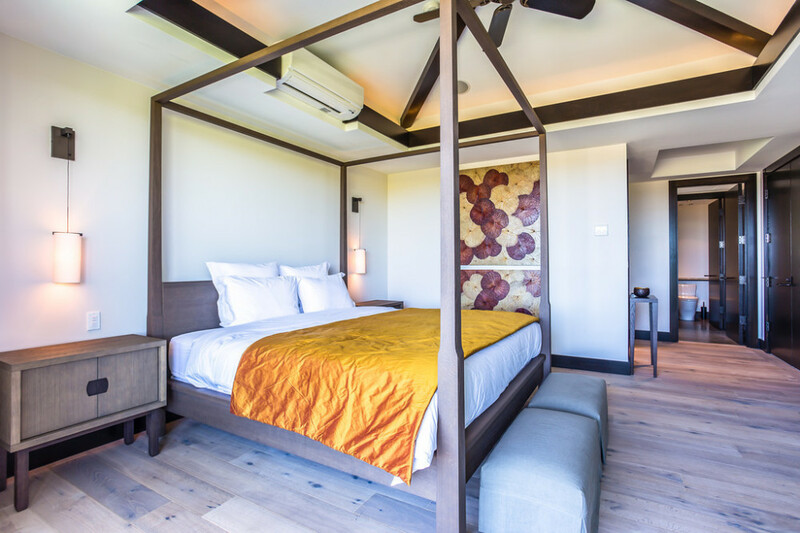 The upper floor guest suite, with its canopy bed is beautifully furnished and opens to sunrise views from the balcony. A additional den can be used as a fourth sleeping room for a child or single adult. 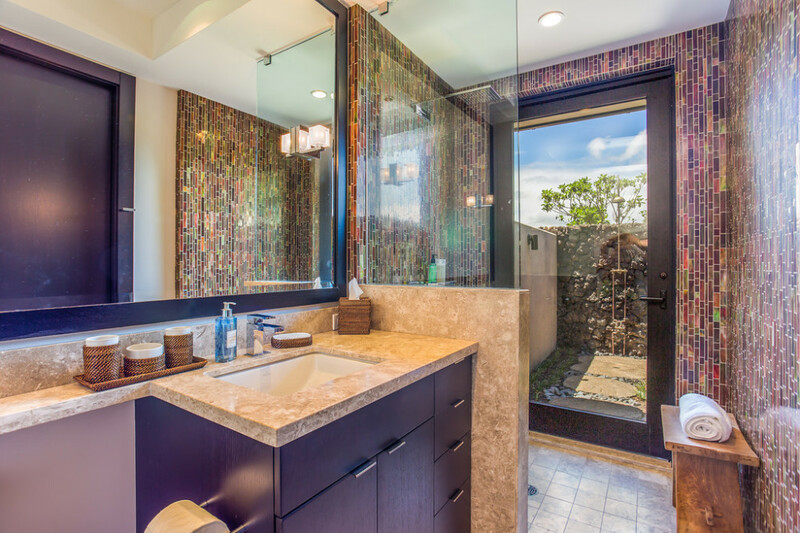 Outside the main house, in a garden courtyard, are two complete bedroom suites, each with its own bath and walk in closet as well as private outdoor shower garden. 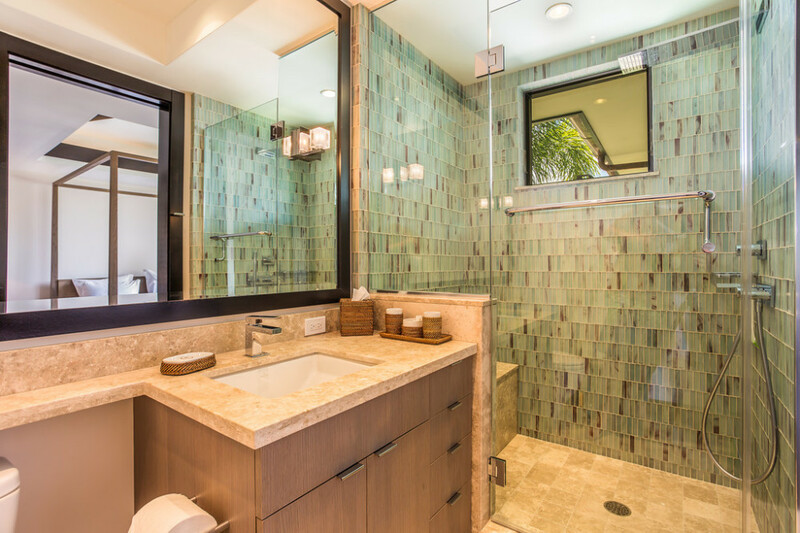 Artevilla was conceived to be the perfect combination between the art of Hawaiian well-being and contemporary style. 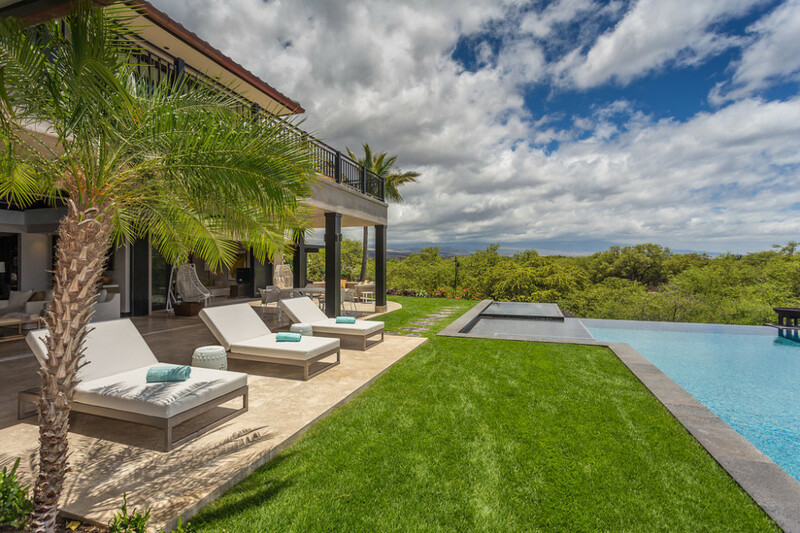 Environmentally current, the home runs efficiently on solar energy and features beautiful decorative sculptures, paintings and art objects from all over the world. 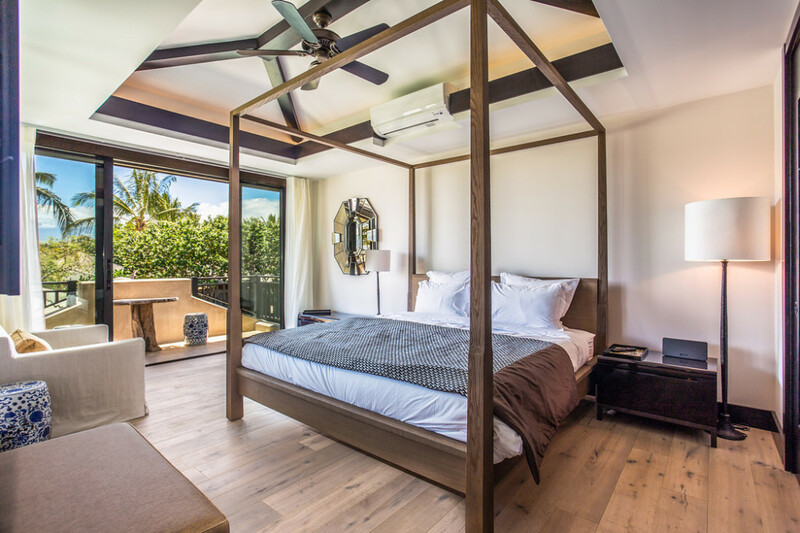 The furnishings, predominantly French, have been custom designed for the house combining the highest quality of wood and natural fabrics such as fine silk and linen. 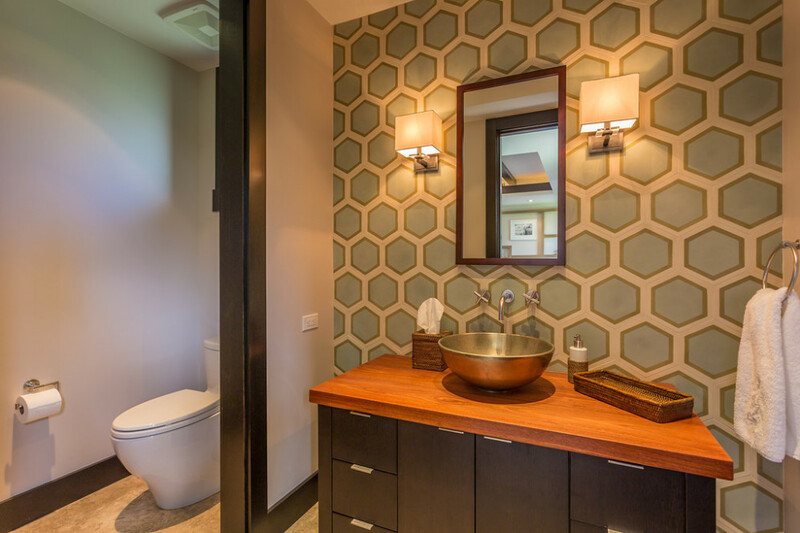 The pleasing colors harmoniously blend with the dark oak wood trim and ceilings throughout. 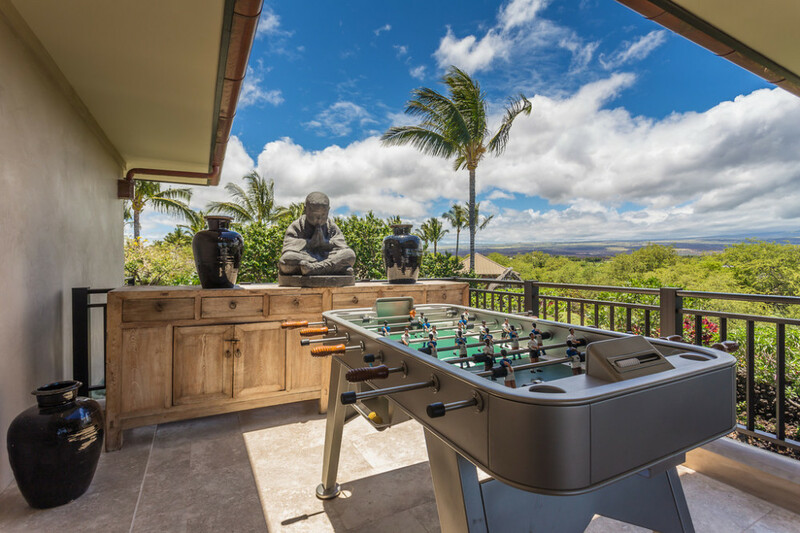 The outdoor furnishings by Kettal are extremely comfortable and the billiard and the foosball tables are perfect for entertaining children of all ages. 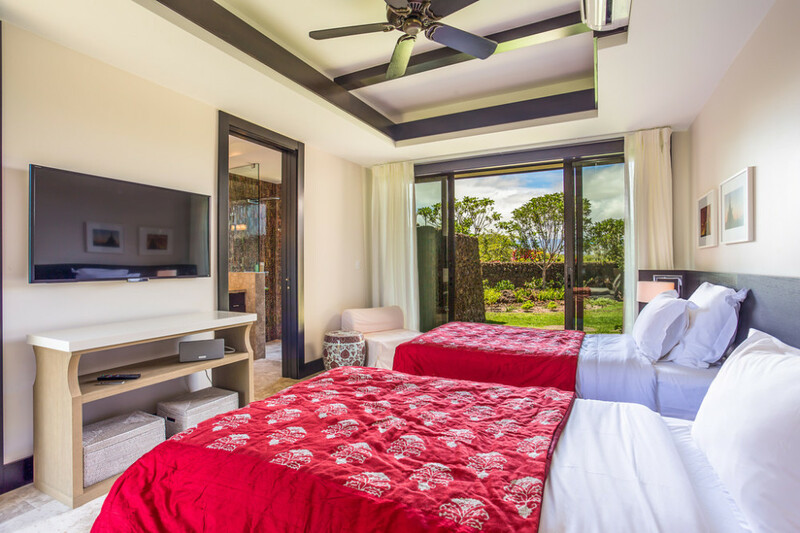 Your stay includes a daily, light housekeeping, and an electric GEM Car which is perfect for driving around Mauna Lani Resort. 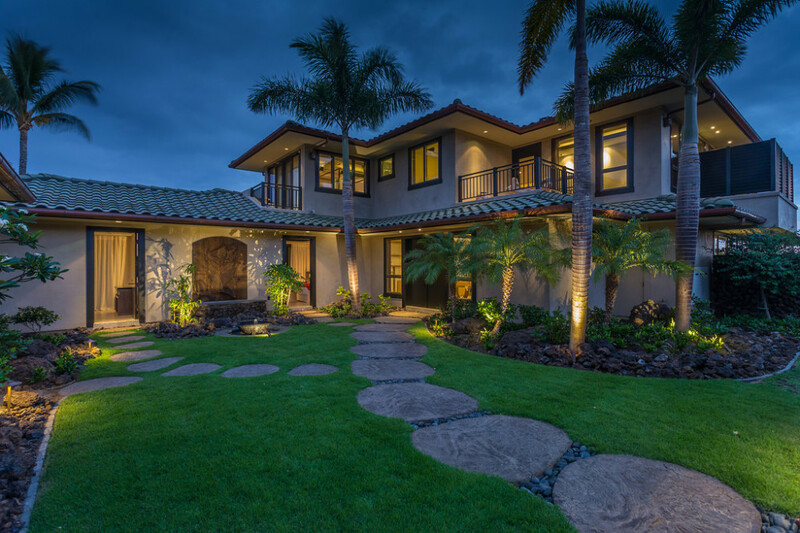 This stunning, one of a kind residence features 5,312 square feet of air conditioned living space plus 1,244 square feet of covered lanai and 1,000 square feet of uncovered lanai. 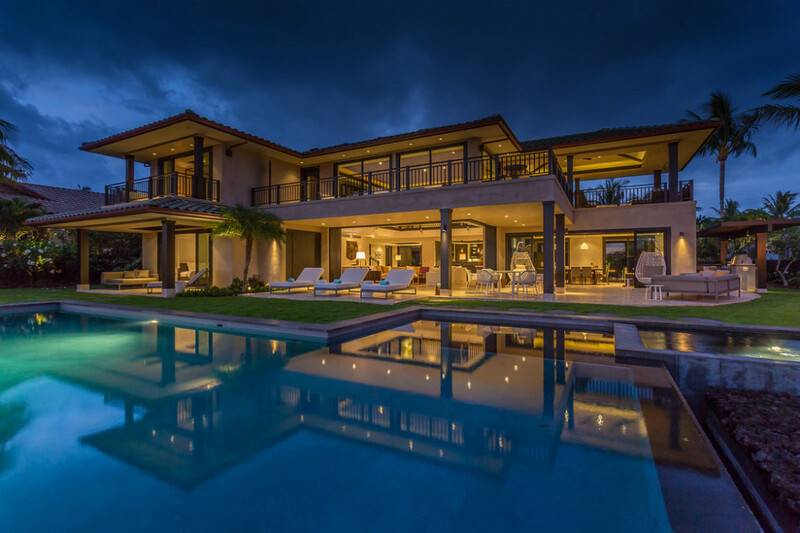 The 46 foot long, salt water infinity pool with baja terrace, and a 6-person infinity hot tub face the ocean and the sky for plentiful sun by day, star gazing by night and the best in outdoor living. 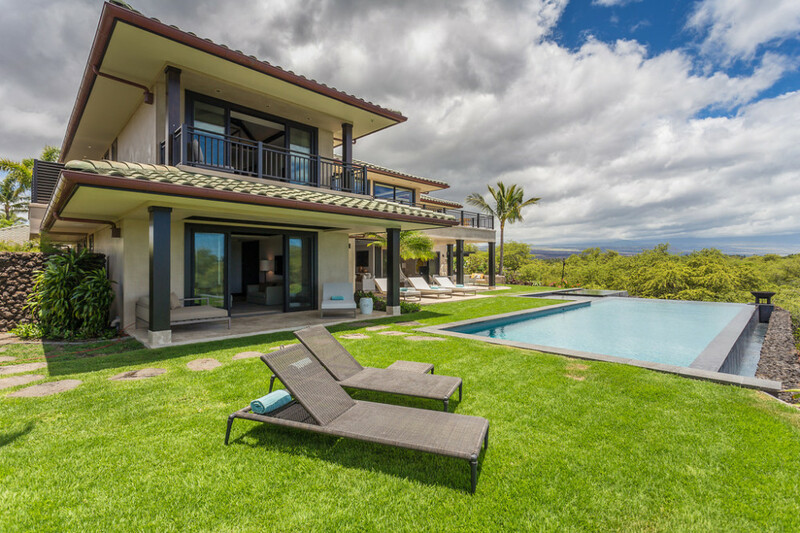 Typical of the Hawaiian style, the house is designed to blend seamlessly with its lush tropical and romantic surroundings and provides the perfect environment for an ultimate and memorable Hawaiian vacation experience. 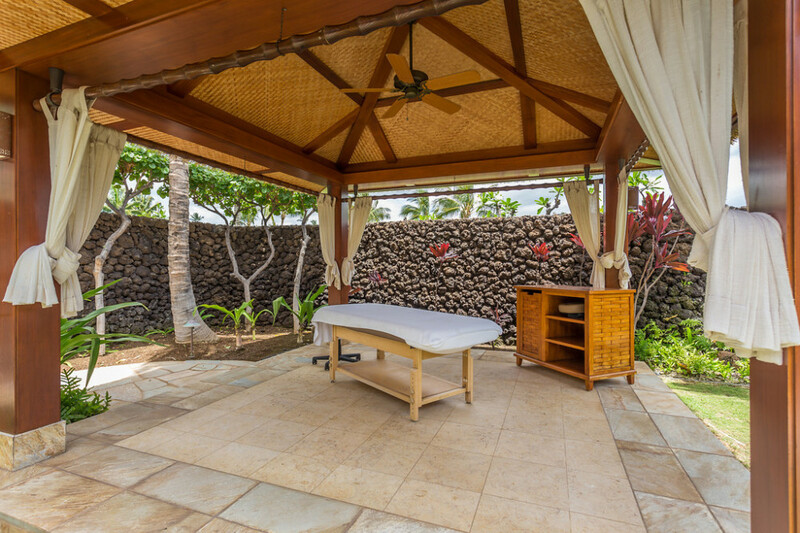 Pauoa Beach is an oceanfront community located between two luxurious hotels, the Fairmont Orchid and the Mauna Lani Bay Hotel. 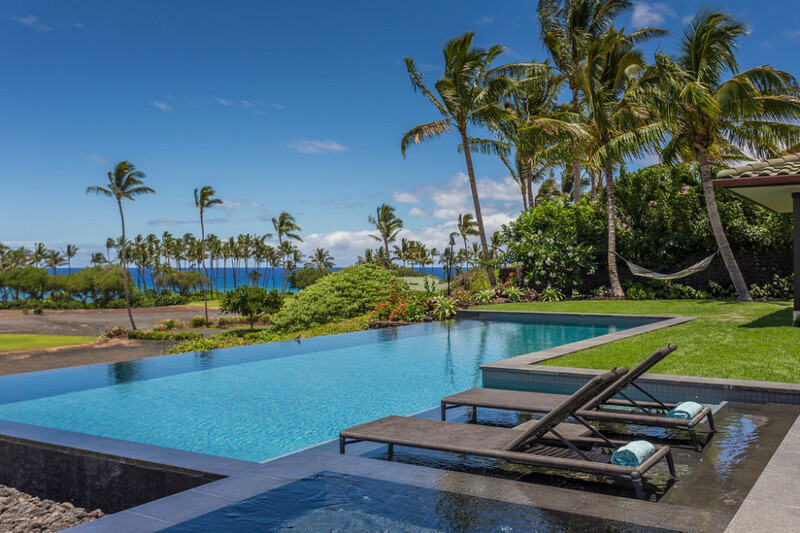 The desert climate on the Kohala Coast is one of the best in the island chain…Warm and sunny with clear skies almost all days of the year. 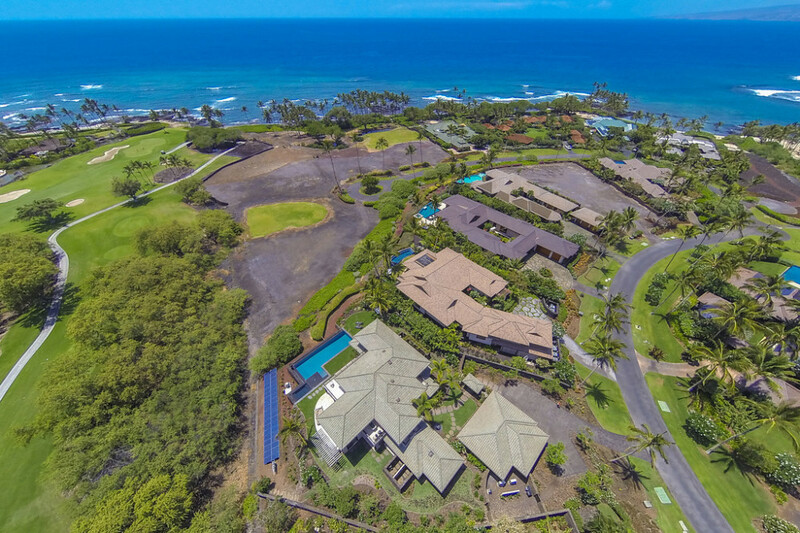 Recently developed, Pauoa beach is one of the most exclusive gated enclaves in the state and offers the highest levels of amenities, construction and location. 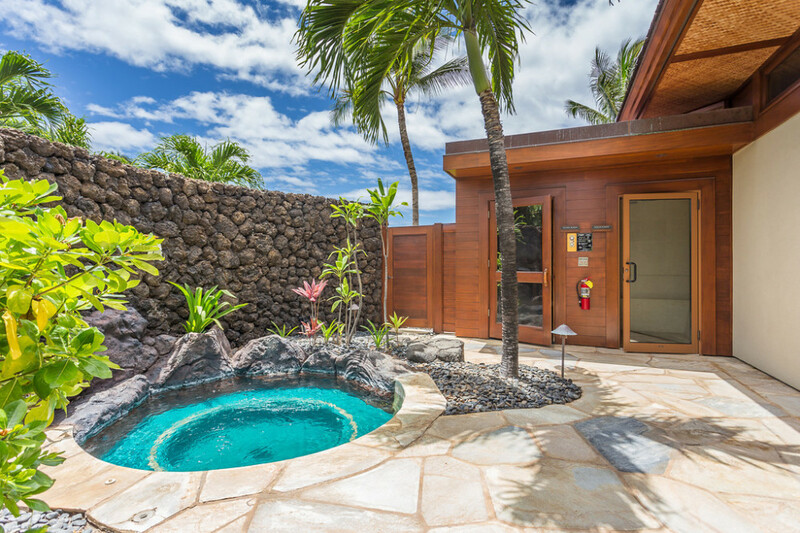 Facilities at the Pauoa Beach Club include a large, stunning negative edge pool, lounges, umbrellas, locker rooms, massage rooms, baby pool, sauna and fitness center. 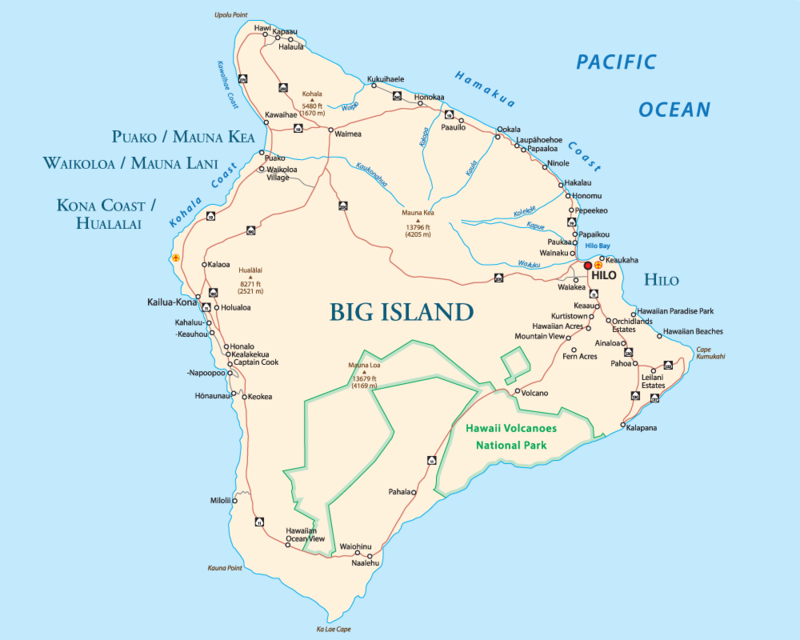 Paoua Bay, with its white sand beach and palm trees, is one of the most picturesque in Hawaii where sealife abounds. In the winter months, you may see dolphins and whales playing in the warm waters off shore. The calm lagoon, just steps from your club, is the perfect place for snorkeling, paddle boarding and children of all ages. 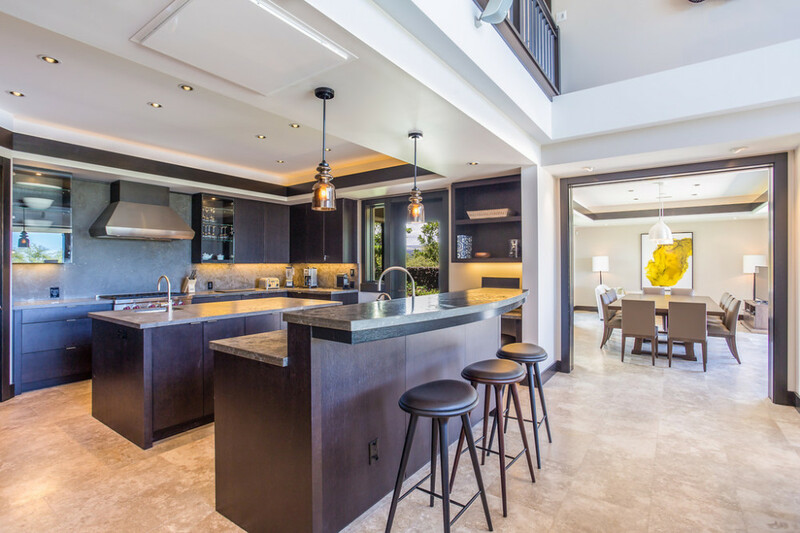 Within the resort, about a 10 min walk from your vacation home, The Shops at Mauna Lani offer a gourmet market, high end shopping, and 5 gourmet restaurants as well as special free cultural events on the plaza. 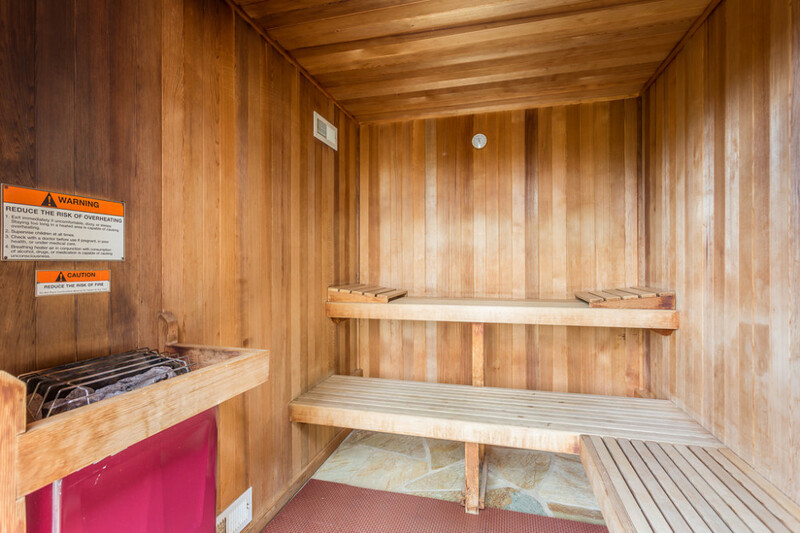 Staff Services: Daily, light housekeeping included. Additional staff services available at an additional cost.